The Muon is a small electrically charged particle, much like an electron only more massive. Muons are especially useful when it comes to testing and measuring the effects of special relativity. This comes about for a number of reasons. Firstly the muon carries an electric charge, which means that it can be manipulated by means of magnetic fields. Being a sub atomic particle it can be accelerated to velocities close to that of light and in fact muons can be created which are travelling at a range of different speeds from stationary up to the speed of light. But the most important characteristic of the muon is that it has a finite lifetime. Stationary muons are seen to self-destruct after a period of about 2.2μsecs. After this time the muon disintegrates into an electron and two neutrinos. The muon it seems has a built in clock or timer. Inside the muon there would appear to be a mechanism that leads the muon to self-destruction in a consistent manner after a short interval. This gives us an opportunity to directly observe how time is affected by relativity. We can see how this internal clock behaves in muons that are stationary and in muons that are moving at speeds close to that of light. It was precisely such observations which provide some of the first evidence that special relativity is a real phenomenon. It would not be unreasonable to expect that a muon travelling at almost the speed of light, close to 300,000Km per second would travel some 660m during its 2.2μsec lifetime. This distance is obtained by simply multiplying the time; 2.2μsecs by the velocity 300,000Km/sec. However this is not what we observe in the case of the muon. Muons entering the upper atmosphere at speeds close to that of light are seen to travel much further than this. This comes about because for the muon, moving at such a high speed, time is running slower than it is for us stationary observers here on earth. As far as the muon is concerned it came into existence and decomposed after the usual 2.2μsecs, but what the muon perceives as a mere 2.2μsecs we perceive as a much longer interval and what the muon perceives as 660m we perceive as a much greater distance. Einstein showed that for objects moving at speeds close to that of light, time runs at a slower rate than for stationary observers, distances in the direction of travel are compressed for the moving observer, relative to those same distances measured by a stationary observer. And the stationary observer sees the mass of the moving object as being increased relative to its rest mass. So for the moving object time runs slower by a factor Gamma, distance between the two same fixed points shrinks by the same factor Gamma for the moving object relative to the stationary observer and the mass of the moving object appears larger by Gamma for the stationary observer than for the moving observer. 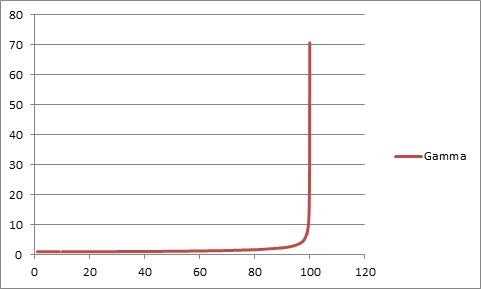 Plotting Gamma against v/c shows that it lies close to unity until v approaches the speed of light and then it appears to shoot off rapidly to infinity as v = c. So for example when v/c = 50% Gamma has a value of 1.154, when v/c=99.5% Gamma has a value of 10 and when v/c = 99.94% Gamma has a value of approximately 30. So if our muons happen to enter the earth’s atmosphere at 99.5% of the speed of light, where Gamma has a value of roughly 10 times, the muon will travel some 6.6Km before disintegrating and we will observe it for 22μsecs. The muon however will perceive its lifetime as 2.2μsecs and the distance it covered as 660m. Both parties agree on the relative speed, so for us stationary observer the velocity is 6,600m in 22μsecs, or roughly 300,000Km per second, while for the Muon the speed is 660m in 2.2μsecs, the same 300,000Km per second. Indeed this property whereby both parties agree on their relative speed lies at the heart of Einstein’s thought experiment on Special Relativity and is deemed to be axiomatic. Speed is said to be invariant with respect to relativity. However this difference in perception of distance and time does yield some rather interesting results when we come to consider frequency. For the muon however, it perceives the distance covered as being just 660m, but of course it still passes 660 fence posts. This means that as far as the muon is concerned the fence posts are one every metre and not one every ten metres as we perceive. It is a similar story with the temporal frequency. The muon passes 660 fence posts in 2.2μsecs and so it perceives the frequency with which it passes the fence posts as one every 3.3 nanoseconds corresponding to a frequency of 300MHz, not the one every 33nanoseconds and 30MHz that we perceive. In fact the muon sees both spatial and temporal frequency as being multiplied by the factor Gamma. In this example the muons are travelling in a straight line but what happens if muon follows a curved path and in particular if it follows a circular path? The first question to address here is whether we can apply the rules of Special Relativity in such a case, Special Relativity relates to objects which are after all moving at constant velocity and an object following a circular path is subject to a constant (centripetal) acceleration. The answer is that this does not matter; an object orbiting at a constant orbital velocity is subject to the effects of Special Relativity in consideration of its orbital velocity, which is by definition constant. In effect we are resolving its motion into an orbital component and a radial component. The orbital component is constant and only the radial component is varying due to the centripetal acceleration. There is solid experimental evidence to back up this idea. In 1977 an experiment was conducted at CERN in which muons traveling at close to the speed of light were injected into an apparatus called the Muon Ring. In the Muon Ring Experiment muons are fired into a 14 m diameter ring at 99.95% of the speed of light and are steered by use of a magnetic field to travel around the ring. The circumference of the ring is some 44 metres. If relativity was not involved, we would expect the muons to travel some 660m during their 2.2μsec lifetime or roughly 15 times around the muon ring. But of course they do not. At 99.95% of the speed of light Gamma has a value of 30 and the muons are seen to travel for 66μsecs around the ring and to cover a distance of 19800m and complete some 450 circuits of the ring. The muon is experiencing time elapsing at a slower rate and so travels further in our domain than simple non relativistic mechanics would allow by a factor Gamma. This is consistent with our earlier finding, at least in one sense. Here we see that the orbital frequency is multiplied by Gamma, just as was the case with the straight line motion above. However there is one important difference. We measure the distance travelled by the Muon as 19800m at a radius of 7m and so we perceive the total angular displacement as being 19800/7 = 2828 radians, that is 450 complete orbits. The muon on the other hand perceives the distance travelled to be 660m, but this is at the same radius of 7m, hence it sees the total angular displacement as being 660/7=94 radians or 15 times around the ring. Suppose we mark some fixed point on the ring in some way. We can call this point GO. As far as the muon is concerned it has completed 15 orbits, however during this time it has passed GO some 450 times. Or for each orbit it has passed GO 30 (Gamma) times. Which brings me to my strategy for winning at the game of Monopoly. The idea is for me to use a muon as my monopoly piece rather than the more usual top had or flat iron. With my muon I can throw a dice and move around the board at 99.95% of the speed of light. Every time I complete one circuit of the board I pass GO 30 times and so collect £6,000 instead of the usual £200. I thought this strategy was foolproof until I suggested it to my 11 year old niece. Her response was that she did not want to play Monopoly with a relative. Game over. ← Not so sure about the Heisenberg Uncertainty Principle?